This is baby Camilo. Camilo and his family decided they wanted pictures done for the change of season. They didn’t quite want Christmas pictures, however. 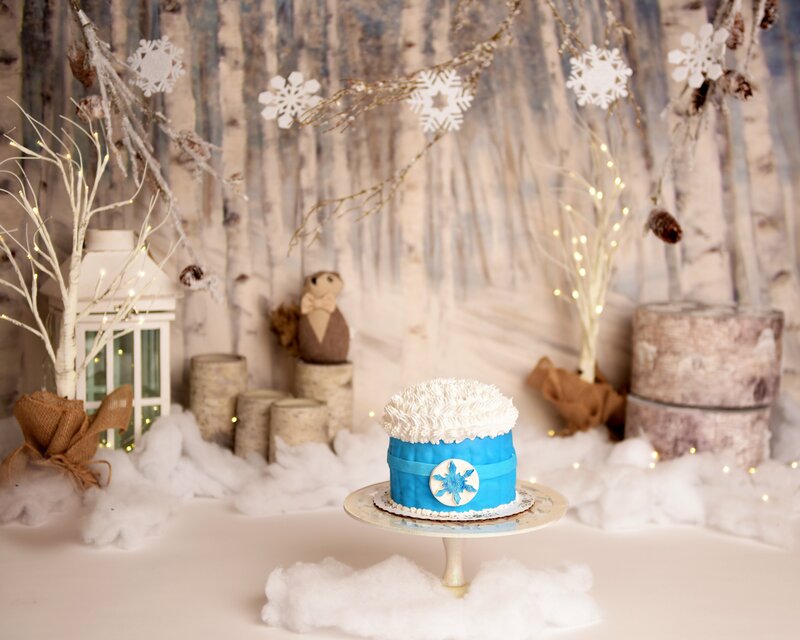 Instead, they decided on a classic Winter Wonderland theme! To get ready for this session, I decided to design a set that was based on the color white. A white snowy backdrop lined the walls, and a white floor with some fluffy snow made this session feel like it was taken outside! Baby Camilo was absolutely adorable and such a joy to capture! He was very pleased to be in front of the camera and especially being featured in such a wintery theme. When he first saw the cake, he wasn’t quite sure what to think about it. He looked at it, wondering if it was okay. With a little encouragement from his family, he dug in, and the rest is history! 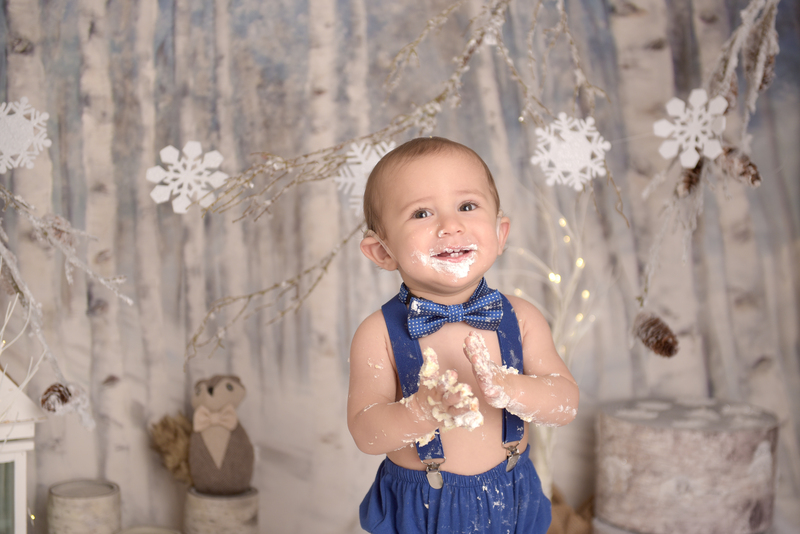 About Our Winter Cake Smash Sessions this Year! As seasons change and leaves start to fall, winter gets closer and closer. As an NYC native, I know how cold it gets. You don’t have to worry about bundling up for pictures this winter because I have a warm studio with lots of winter props just waiting for you and your little one! 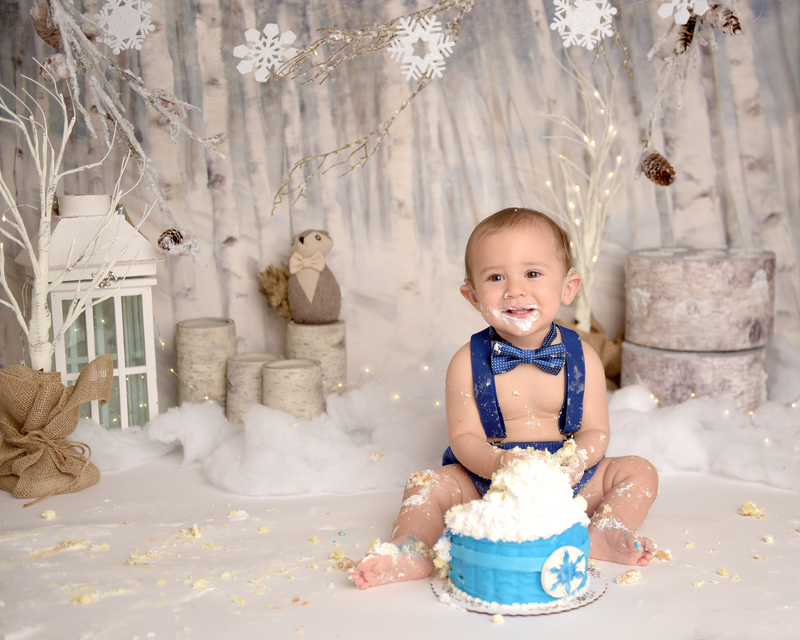 Camilo and his family were definitely glad to be out of the city’s cold and into a warm studio with a delicious cake, waiting to be smashed! I included some winter trees in the background, as well as some birch logs, and a white lantern. Baby Camilo decided he should wear blue so that he stands out from the surrounding snow! 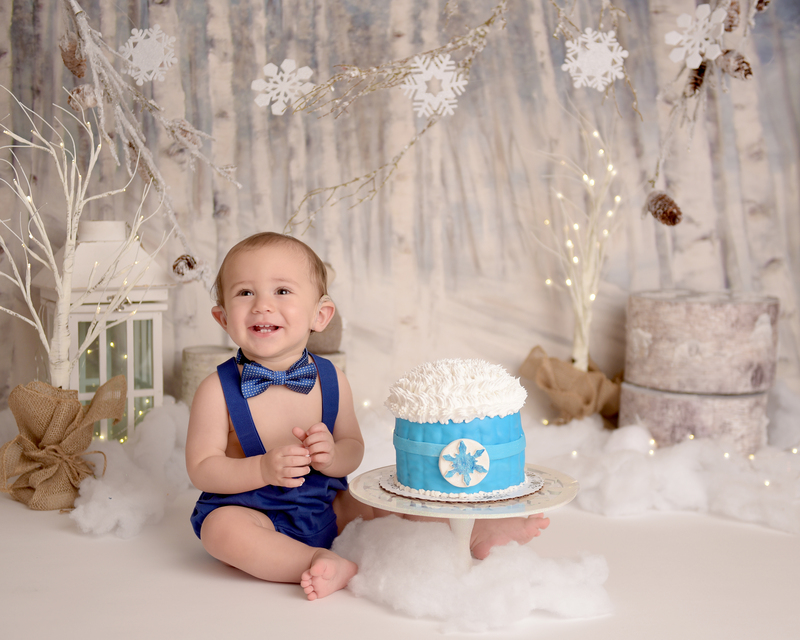 He just so happened to match his light blue cake that we made for the session, covered with white frosting. As shown above, Camilo is more than happy to dig into his cake once he has tried it! Baby Camilo and Mom loved his session. I’d say Camilo had a great time, judging from the picture above! Every session I do, like Camilo’s, is completely custom to bring all of my client’s visions to life. Designing your session is my absolute favorite part of my job. I mean, how fun is it to completely design a set and bring a vision to life, especially a winter wonderland?! To create your session today like Camilo’s, please contact me here. Let’s make some magic!